If you wouldn't mind, I am going to whine for a moment. I LOVE fall, but ever since autumn has come to the valley we have had nothing but NON-STOP RAIN! For days and days on end it has literally poured. Just when I was about to just curl up in my bed, not to emerge until spring, we FINALLY had a break in the weather. The sun came out, the grass dried up, the leaves were absolutely stunning, it was a glorious moment indeed. That is when I knew I was going to grill out for dinner. I wanted to be outdoors, enjoying this time of year, and this may be the only chance I get before the leaves are gone. I headed to the store for some inspiration and to my delight they were having a sale on their zucchini and peppers! Instantly I thought KEBABS! I think kebabs are delicious, but they can be tricky. Often times they are bland and if the sticks are overcrowded the meat will be raw while the vegetables are burnt. However, if you follow these simple steps I know that your kebabs will turn out perfect every time! I forgot to take a picture of this step, but if you do not want your kebab stick to completely incinerate on the grill, you will need to place them in a baking dish filled with water. They will need to soak for AT LEAST 30 min., but overnight is best. Then you will want to trim any of the undesirable tidbits off of your chicken and cut it into cubes. Place the cubed pieces of chicken into a Ziploc bag. To the bag, drizzle enough olive oil over the chicken to coat it. and a 1/2 tsp. of pepper. Push the air out of the bag, zip it up, and massage the contents until everything is coated with the marinade. While your chicken is marinating in the fridge, you can take this opportunity to prep your vegetables. Remember, you are going to be be skewing and grilling these so make sure you are cutting them into larger bite-sized pieces. Just like the chicken you will place the vegetables into a Ziploc bag. I did not add the mushrooms to the bag because I did not want them to get soggy. And again, you are going to drizzle a little olive oil over them. And a 1/2 tsp. of seasoning salt to the bag. Because these are vegetables you are not going to massage them, but gently move them around in the bag to make sure they are well coated. Let them marinate until the chicken is finished. Once your chicken and vegetables are finished marinating you can assemble your kebabs. I like to get creative and make patterns, but you can assemble them anytime you want. Just make sure you do not overcrowd them. I like to leave a little space between each item. If you run out of chicken before vegetables don't worry. Just make some veggie kebabs. I will be honest when I say those are my favorite. Now you can take the kebabs out to the grill! I cook mine over a medium heat. I cook them for 6-10 minutes, turning them every couple of minutes. You make have to move them around depending on where the hot spots on your grill are, but the results are well worth it! Look at that! Beautifully grilled chicken that is still mouthwateringly moist. And those vegetables, oh the vegetables, they are charred to perfection and packed with flavor! This is a perfect weeknight meal that is quick and easy. Not to mention kids will tend to try anything on a stick!! 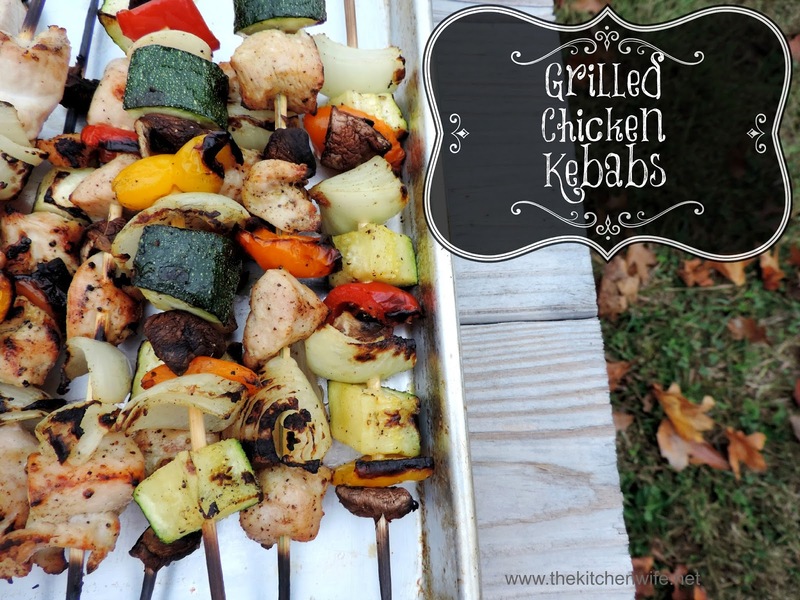 Give these great Grilled Chicken Kebabs a try tonight! You won't regret it! Soak the kebab skewers in a baking dish of water for at least 30 minutes. Trim and cube the chicken breast. Place chicken cubes into a resealable bag and add the olive oil, 1/2 tsp of seasoning salt, 1/2 tsp of salt, and 1/2 tsp of pepper. Press the air out and seal the bag. Massage the meat so that everything is coated with the marinade. Place in the fridge for 30 minutes to overnight. While the chicken is marinating, take this opportunities to prep the vegetables. Be sure to cut them so that they are large enough to skewer and grill, but still a bite-sized portioned. Drizzle with olive oil and the remaining salt, seasoning salt, and pepper. Seal the bag and gently move the vegetables around so that they are all coated. Allow them to marinate while the chicken marinates. After the chicken has finished marinating assemble your kebabs, making sure to leave a little space between each item. *Do not add mushrooms to the bag. They will become mushy. **You may have to move the kebabs around on your grill depending on where the hot spots are.